ComplyXL is available now. Single user pricing is from €595/ £500/ $785	per Desktop edition seat and €1,025/ £865/ $1,355	per Professional edition seat. For detailed information visit our pricing page. ComplyXL helps to ensure you meet your Sarbanes-Oxley compliance requirements. With a full version history held within a secure repository, you know who has made changes, when and EXACTLY what has been changed. With the enterprise version of ComplyXL all versions of a workbook are saved and retained within a central database application. This means that access to the version history can be controlled and monitored. 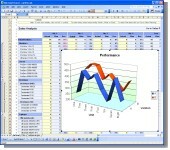 Information in spreadsheets is a corporate resource. Some users will need to be able to update workbooks; others will need only to access information while others will not be allowed access at all. Access rights can change over the life-cycle of a workbook and with the operational period of a business. ComplyXL enterprise controls access to workbooks through a system of roles and user rights that can be modified as needed to ensure that workbook information is available when needed while still being effectively controlled. Although workbooks managed by ComplyXL are centrally managed, the user experience is unchanged. Users still open and save workbook files so that there is no need for additional user training. If you use Sharepoint document libraries ComplyXL understands how to access the version history for server-based documents so that you see detailed reviews of the differences. With enhanced comparison facilities now you can select how you view your information, whether to focus on changes to numbers, text, formulas, formats, locked cells or any combination, its up to you. The ability to produce detailed difference reports as well as capturing change review snapshots helps ensure your auditors are happy. Save snapshots to document the compliance reviews completed. Snapshots are reports recorded in the repository alongside the workbook version history and record the reviews undertaken by managers or compliance staff. Saved snapshots record the reviewer, date and an optional comment. Snapshots can be recalled and printed at any time. The dynamic nature of the snapshots means that subsequent reviews can be continued in the original review context if required. Never be in doubt about changes made to workbooks or who made them and when. 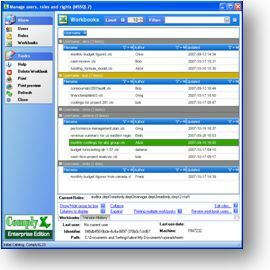 ComplyXL can continuously monitor activity on file servers or PCs to capture changes to workbooks as soon as they occur. There's no need to change the location of files as ComplyXL will monitor files wherever they are. Nor it is necessary to disable Excel features or change the way users work with Excel. It's simple to set up and end users will be unaware their changes are being captured. The discovery capability allows you to find the workbooks in your organization. Working with ComplyXL Enterprise the Spreadsheet Discovery option allows an organization to create processes that will scan file servers and PCs for new and changed workbooks so that they can be pro-actively added to the managed repository. Spreadsheet Discovery can be scheduled to run periodically and scan a whole hard drive or just a sub set of the folders. Managers are able to decide whether discovered spreadsheets will be updated in the future. Keep up-to-date with changes to spreadsheets you work with. Users can subscribe to be notified when workbooks are changed. Users can choose to receive change notifications via email or instant messaging clients such as MSN Messenger (Windows Live), Microsoft Live Communications or Jabber (XMPP).